Recently I took a trip to Portland, Oregon for an evolution convention. After a late wakeup, rather than heading straight to the convention, my friend Dorothy and I decided to get brunch at Café Nell (where we had dinner the night before). One of the things I ordered was a poached pear, which was served on a long white plate with beautiful streaks of intermingling orange syrup and yogurt. It was absolutely divine and I told Wilson over the phone that I needed to attempt its recreation when I got back. Sometimes when I eat something that’s really good, I have trouble getting it out of my head until I can make a similar dish myself. After a little more gushing over my poached pear experience, Wilson and I first consulted Mark (or more correctly, How to Cook Everything by Mark Bittman – we refer to both the book and the person as, “Mark”). 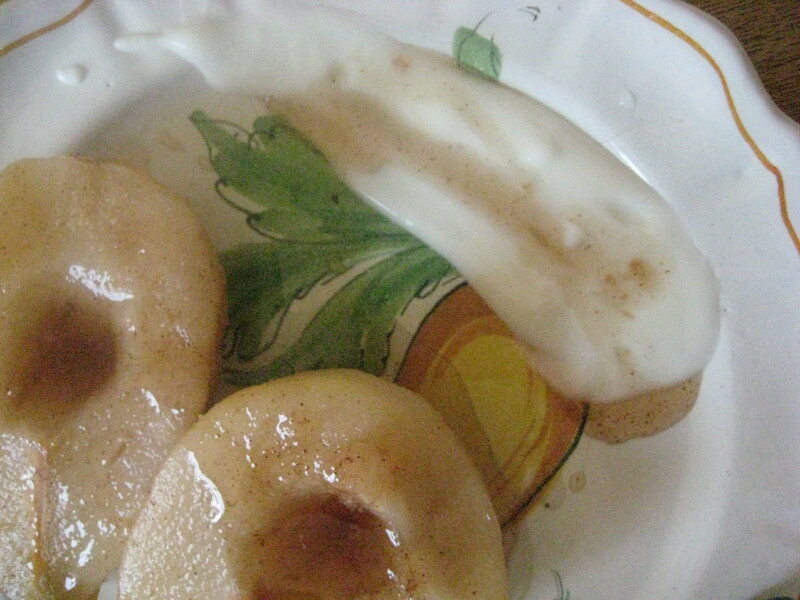 We decided to use a cinnamon rather than orange syrup, and serve the pears with yogurt, as I enjoyed them in Portland. These pears were incredibly simple to prepare – just simmer and wait. They were also incredibly delicious. The voluptuous pear halves become slightly soft and perfectly spicy-sweet with the addition of the syrup. We had them for breakfast on a Saturday morning and enjoyed leftovers the following evening for dessert. My breakfast in Portland was perfectly scrumptious, but I must say that enjoying a similar dish at home with Wilson was much more fun. I love fruit– naked, in a pie, in cereal, on ice cream, you name it. But somehow this dish elevates the pears to something more luscious, without hiding the purity of the flavor and texture in pears. There is certainly nothing wrong with all of the decadent desserts that seem to be everywhere this time of year. But, sometimes simplicity is also worthy of celebration. Combine the sugar and cinnamon with 5 cups water in a medium saucepan (large enough to accommodate the pears) over high heat. Peel the pears, leaving their steps on. Core them by digging into the blossom end with a melon baller, spoon, or pairing knife. Lower the pears into the boiling water and adjust the heat so that it simmers gently. Cook, turning the pears every 5 minutes or so, until they meet little resistance when prodded with a thin-bladed knife, usually from 10-20 minutes. Turn off the heat and allow to cool in the liquid. Transfer the pears to serving plates. Reduce the poaching liquid to a cup of less, then spoon a little over each pear before serving. Serve with plain or vanilla yogurt if desired. Oooh, you had me at cinnamon! It’s been a long time since I’ve poached pears. Might just have to give it another go soon! Poached pears are one of my faves. And the cinnamon syrup just makes them even more special. So simple, yet truly delicious. 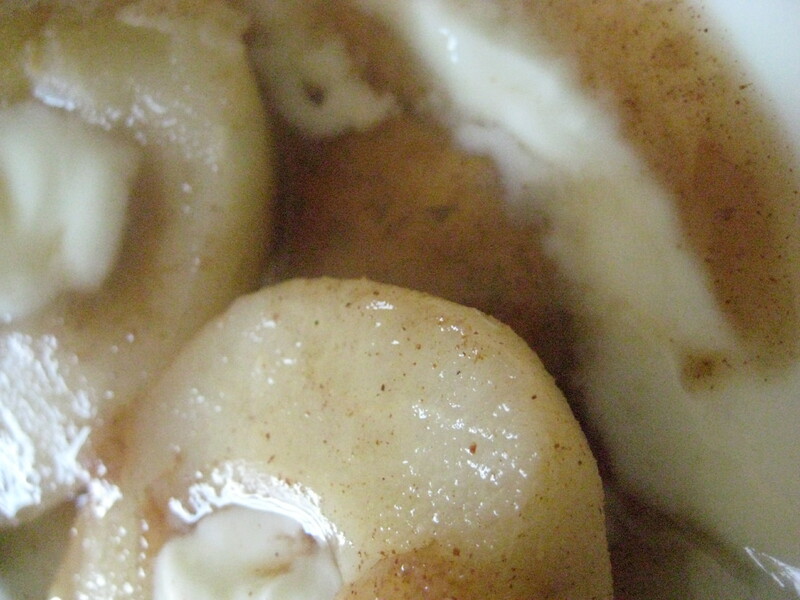 I love poached pears with yogurt and the cinnamon syrup looks delicious. Love the idea of cinnamon syrup. These sound fantastic. I so enjoy that book by Mark Bittman…there are so many great recipes to be found! This simple pear recipe seems like one of his many winners. I would eat this for breakfast, lunch or dinner! Thank you for sharing it with me. I hope you have a glorious Tuesday! I haven’t had poached pears in a long time – thanks for reminding me how great they are, and how I should be making them soon! Poached pears take on such amazing flavor! Thanks for the reminder to make some soon. My, my…do those ever look good! 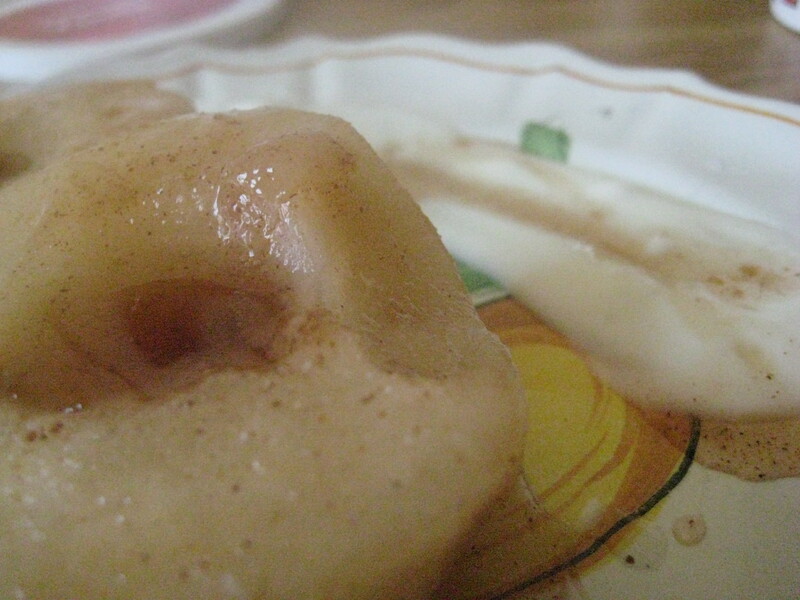 I love poached pears, but the cinnamon syrup just takes them to new heights! Poached pear are so easy and classy on the dessert plate! 🙂 love cinnamon with pears! Yum! I love the simplicity of this recipe. I always forget about pears and am pleasantly surprised when I remember to buy them! I love poached pears with red wine cinammon syrup. I guess for those who do not want an liquor, this is the best alternative.